Following querying from TheJournal.ie, it is unclear whether the Prime Minister was aware of who she would be celebrating when making the announcement this week. 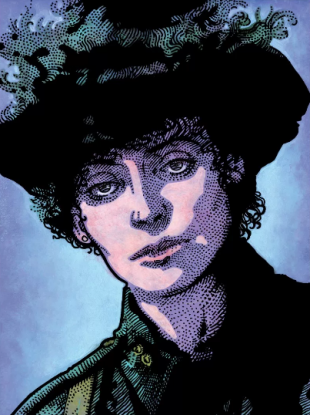 Artwork of Countess Markievicz by Jim Fitzpatrick. THE UK COULD celebrate the centenary of the first woman elected to the House of Commons next year – which is the Irish Republican Countess Markievicz. Constance Markievicz was elected to parliament in a general election in 1918, and as Ireland was still ruled by the UK government at the time, she was to take her seat in Westminster. But as a member of Sinn Féin, whose members abstained from taking their seats as it would mean swearing an oath of allegiance to the crown, she never took her seat. The first woman to take her seat was Nancy Astor in a by-election in December 1919. Speaking in the House of Commons on Wednesday, UK Prime Minister Theresa May acknowledged that it was important to mark the centenary of the first female member of the House of Commons. Can I say to my right honourable friend, that I think it is important that we mark the centenary next year and recognise the role that women have played in this House and in their time in the area of public life. Although Markievicz wasn’t mentioned by name (Morgan left specifics out of her query, saying, “Next year sees the centenary of the first woman member of parliament…”), she was the first and only woman elected in December 1918. A law had been passed earlier that year to allow women to stand as candidates. Any such centenary celebration, therefore, would have to be for Markievicz and Markievicz alone. When asked for clarification on the PM’s comments, House of Commons said that whatever is said in the House is to be taken as it stands; both the House and the Conservative Party directed TheJournal.ie to check with No 10. When TheJournal.ie contacted No 10, the press office said that it was unaware of any planned centenary event. A more detailed statement was not available at the time of publication. Morgan is involved in the Vote100 series, which is a parliamentary committee set up to celebrate women’s place in parliament. Its centrepiece will be a major exhibition during summer 2018 in Westminster Hall. Born in February 1868, Constance Markievicz (her maiden name was Gore-Booth) was a suffragette, a socialist and a leading figure in the Irish Republican movement. She played a major part in the 1916 Rising and was sentenced to death, but her life was spared because she was a woman, and because of her privileged and powerful background. She was a founding member of Cumann na mBan and the Irish Citizen Army, became the first female minister in the Ireland’s first Dáil, and the second woman in the world to hold a Cabinet position as Minister for Labour from 1919 – 1922. TheJournal.ie has requested further comment from Morgan but had not received it by time of publication. Email “Theresa May wants to honour the first woman elected to House of Commons - republican Countess Markievicz”. Feedback on “Theresa May wants to honour the first woman elected to House of Commons - republican Countess Markievicz”.